The strains of industrial animal agriculture continue to show. 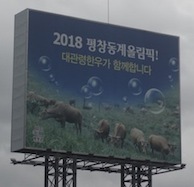 In Anheung in Gangwon-do, where tens of thousands of pigs were buried alive, water supplies have become contaminated. The government is currently installing tunnels and pipes to transport water from a different region to each home in this area. In the summer of 2012, the heat wave has led to the death of over 830,000 farm animals in Korea, mostly chickens. The recent drought in the U.S. has also affected Korea. With decrease in production of U.S. crops used in animal feed, there has been less available for export, and prices for animal feed are soaring in Korea. The cost of beef in Korea, interestingly though, has been going down because farmers can no longer afford to feed their animals, so they are selling them off. There’s currently a surplus on the market, driving the price of beef down. What will the next few years leading up to 2018 bring in terms of climate and agriculture? Read more. Double-click to view full screen.